Arachnids differ from insects mainly in the number of legs they possess: eight instead of six. There are two important orders from the toxicological point of view: Scorpionida and Aranea, both belonging to subphylum Chelicerata. The members of this order comprise scorpions, which are capable of inflicting severe, and sometimes fatal stings. There are at least 650 different types of scorpions divided into 6 families. Most species are nocturnal, and seek areas that are cool and moist. · The scorpion has a cephalothorax (fused head and chest), an abdomen, and a six segmented tail which terminates in a bulbous enlargement called telson. The telson contains the stinger and venom apparatus. In addition, the scorpion also has two claws (chelae or pedipalps) which help to grasp its prey. Scorpions differ in colour from straw yellow or light brown, to black. · The commonest species seen in India is Mesobuthus tamulus (red scorpion) (Fig 12.39). It grows up to 3 inches in length. Larger scorpions are found in the outdoors (Palamnaeusspecies) which grow up to 7 inches (Fig 12.40). · As a general rule, scorpions with thick and powerful claws are less toxic, while those with slender claws are more toxic. · Scorpions sting; they do not bite. Components of scorpion venom are complex and species-specific, those of the family Buthidae being the most potent. The main toxins include phospholipase, acetylcholinesterase, hyaluronidase, serotonin, and neurotoxins. The venom of Buthus species of India contains phospholipase A, which causesgastrointestinal and pulmonary haemorrhages, and dissemi-nated intravascular coagulation. · Most scorpion venoms affect sodium channels with prolon-gation of action potentials, as well as spontaneous depo-larisation of nerves of both adrenergic and parasympathetic nervous systems. Thus, both adrenergic and cholinergic symptoms occur. · Hyperkalaemia, hyperglycaemia (with reduction in insulin secretion), and increased secretion of renin and aldosterone are characteristic of stings by Mesobuthus tamulus. 1. Rapidly developing, excruciating local pain, swelling, redness, and regional lymphadenopathy. 1. Signs of autonomic stimulation occur, comprising mydri-asis, profuse sweating (Fig 12.41), urticaria, excessive salivation (Fig 12.42), vomiting, parasternal lift, priapism (Fig 12.43), hypertension, brady-/tachyarrhythmias, and ventricular premature contractions. 2. Pulmonary oedema may develop within 2 to 3 hours leading to death. 3. Intracerebral haemorrhage resulting in hemiparesis, from a scorpion sting, has been reported. Convulsions may occur. 4. ECG changes: Early changes suggestive of envenomation include peaked T waves in leads V2 to V6 ( Fig 12.44), Q waves, ST-segment elevation in leads I and AVL, and left anterior hemiblock. 5.Hyperglycaemia is common with most species. Acute pancreatitis has been reported with some species. 6. Allergic reactions, including anaphylaxis has occurred. 7.Palamnaeus species causes local pain, paraesthesias, mild autonomic nervous system excitation, pulmonary infiltra-tion, eosinophilia, salivation, nausea, sweating, and mild hypotension. 8. Children under the age of 10 are more likely to develop toxicity from most scorpion stings than older victims. Effects are most severe in infants and toddlers. Most victims (without hypertension or cardiac disease) and children over the age of 5 can usually be handled at home with local application of ice and other supportive measures for pain relief. Patients with cardiac problems/hypertension, elderly victims, and children under the age of 5 should be referred to a hospital for evaluation. · Immobilise the affected extremity. Do NOT apply tourniquet (Fig 12.45). · Local application of ice is beneficial in relieving pain. · Prolonged cryotherapy is however contraindicated. · A negative-pressure suction device may be used, if available, to extract venom at approximately 1 atm of negative pressure (it is doubtful whether this really works). Do not incise prior to suction. · Admit all patients with systemic manifestations (hyper-tension, hypovolaemia, pulmonary oedema) to intensive care unit under close electrocardiographic, echocar-diographic, and if necessary, invasive haemodynamic monitoring. · Patients with respiratory failure or with CNS distur-bances should be mechanically ventilated; administer oxygen to all serious cases. · Pain may be controlled by paracetamol or morphine tablets. · Mild to moderate allergic reactions may be treated with antihistamines, with or without inhaled beta agonists, corticosteroids, or adrenaline. Treatment of severe anaphylaxis must include oxygen supplementation, aggressive airway management, adrenaline, ECG monitoring, and IV fluids. · Correct fluid and acid-base imbalance. However, avoid infusing large amounts of fluids due to the risk of pulmonary oedema. The pulmonary artery wedge pres-sure should be kept relatively low while maintaining adequate cardiac output, blood pressure, and urine output. · Some investigators claim prazocin hydrochloride acts as an antagonist to scorpion venom, and is also cardio-protective. The recommended dose is 500 micrograms every 4 to 6 hours for adults, and 250 micrograms every 4 to 6 hours for children. · Hypertension (>160/110 mmHg) is conventionally managed with nifedipine at a dose of 10 to 20 mg (adults) or 0.3 mg/kg (children) every 4 to 6 hours. · Bawaskar & Bawaskar, renowned experts in the treatment of scorpion stings, recommend that hyper-tension (due to Mesobuthus tamulus envenomation) be controlled by sublingual nifedipine, with peripheral venom action antagonised by the post-synaptic alpha-blocker prazosin. Nifedipine reduces hypertension, and enhances myocardial contractility caused by increased catecholamine levels. Prazosin reduces preload and left ventricular impedence without heart rate or serum renin increases. It also inhibits the suppression of insulin caused by envenomation. Prazosin is also said to be useful in the treatment of pulmonary oedema from scorpion envenomation. · Hypotension is treated with dopamine infusion, begin-ning at a dose of 2 to 5 mcg/kg/min and increasing gradually to 20 mcg/kg/min, so as to achieve and maintain systolic reading of around 90 mmHg. · Pulmonary oedema is treated with prazocin or furo-semide (1 to 2 mg/kg IV every 4 to 6 hours) and oxygen. Life-threatening pulmonary oedema may respond to a nitroprusside drip. · Agitation and convulsions can be controlled with IV diazepam (5 to 10 mg, adults; 0.2 to 0.3 mg/kg, children; repeated every 10 minutes as required). Alternatively, phenobarbitone can be given, 5 to 10 mg/ kg IV. · Persistent vomiting usually responds to metoclopramide 5 to 10 mg IV (adults), or 0.5 mg/kg (children). · Cardiac rhythm disturbances are usually transient and resolve without specific treatment in most of the cases. Persistent tachyarrhythmias can be reversed with propranolol (1 mg/dose IV, administered no faster than 1 mg/min, repeated every 5 minutes until desired response is seen, or a maximum of 5 mg has been given). o A goat serum-derived antivenom has been avail-able in some countries since several years, but there is controversy as to its efficacy. Most patients develop serum sickness syndrome within 2 weeks of antivenom administration. 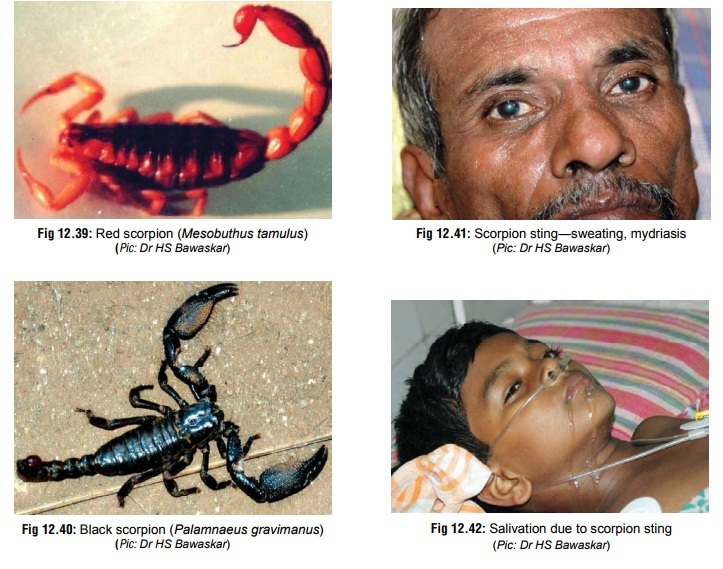 o Scorpion antivenom effective against Mesobuthustamulus has recently been introduced in India. * Therecommended dose is 1 vial (reconstituted in 10 ml of injection water) initially, followed by further doses if required. · Clear debris and rubbish from all areas of work or rest. o Spraying a mixture of 2% chlorine, 10% DDT and 0.2% pyrethroid in an oil base is quite effective. o Alternatively, use a mixture of fuel oil, kerosene, and small amounts of creosote. · Inspect shoes, clothing, and bedding for scorpions. · Do not reach into dark corners, receptacles, or boxes. Use a flashlight first to check for scorpions. · As a rule, if one scorpion has been encountered in a partic-ular area, there will be others around. Females generally give birth to 50 to 60 young, which remain close to where they were born. It is important to locate and kill them all.